Kobelt is proud to introduce its latest development in quality electronic control systems – The Mighty Mariner. This new mini system has all the same attention to detail and quality as its larger predecessor, yet offers a compact economical solution for small and medium craft. The system is comprised of the 6505S control head in combination with the 6527-S electronic actuator, both in sturdy bronze and stainless steel. The control head is completely watertight from topside* and can be used in any location on board. The 6527-S is a stand-alone actuator† with manual override. The electronics are stored in the housing of the actuator itself, eliminating the need for the separate microprocessor unit. The result is a pared-down, economical electronic control system perfectly suited to simplified needs. The installation requirements for the Might Mariner are minimal. Communications is via a CAN Bus. 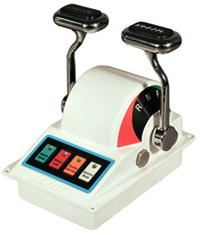 This system offers up to 4 stations with station select, station lock, overriding throttle and synchronization**. The broadest selection of heads, handles and connection gear. Easy installation (Do it yourselfers). Not recommended for runs over 40 feet or where total cable bends will exceed 360 degrees. The 7031 has 2 cu.in. or (7031-X) 2.6 cu.in. volume per turn and our Model No. 7004Due to the simplified construction, and selection of superb materials, this pump will outlast any other product on the market. The Kobelt design eliminates the universal joint - instead the whole helm pump moves with the wheel when rotated up or down. The tilting mechanism provides 5 locking positions at 10o increments with a total rotation of 50o. This unit is available with helm pumps Model No. 7031 or Model No. 7004.
, which has a nominal volume of 3.4 or (7004-X) 4.5 cu.in. per turn.